Distinguished by Wizards of the Coast as one of the premiere Dungeon Masters Guild Adepts, Lysa collaborated with other Guild Adepts to create Platinum best-selling adventures, encounters, and rules that act as "DLC" for Dungeons & Dragons hardcover adventure books. The Guild Adept program spotlights some of Dungeons & Dragons most talented designers and creators. A Platinum-best-selling expansion adventure to Wizard of the Coast's Tomb of Annihilation, Lysa's Ruins of Hisari was written as part of the Dungeon Masters Guild Adept program. It reveals the secrets of Hisari, an ancient yuan-ti civilization that mysteriously crumbled and centers around one question: What happens when you have a creature that reproduces through dreams and subject it the most horrifying nightmares imaginable? What would you bring into the world? Lysa collaborated with artist Jessica Thomas to create a distinct style of maps for this adventure. Overlaid on parchment, the cartography combines simplicity and ease of use with a gritty adventuring feel as if characters have mapped their surroundings themselves. "This adventure will challenge any group of characters and may even alter the way they play them so be ready! 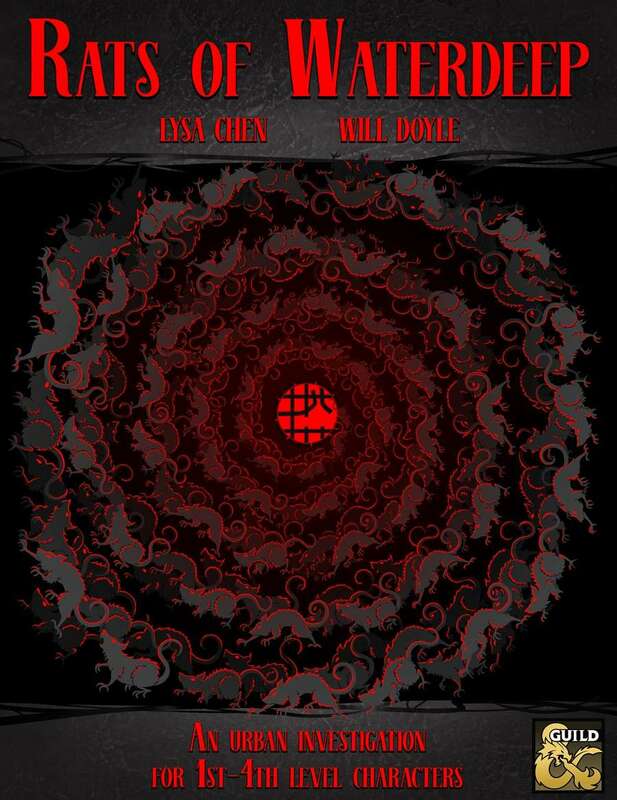 The module reads as equal parts Chuck Palahniuk, Cthulu and old school dungeon crawl with a new jungle based twist." Players solve a brutal crime on - and beneath! - the mean streets of Waterdeep in this madcap companion adventure for Xanathar's Guide to Everything. This Gold-best-selling adventure is a Guild Adept collaboration between Lysa and Tomb of Annihilation author Will Doyle. Part of the Embers of the Last War storyline, the Adventurers League’s premiere Eberron adventure path, Blades of Terror asks adventurers to perform a simple heist… at 30,000 feet. What could possibly go wrong? In this Platinum-best-selling sourcebook of new subclasses, races, magic items, rules, and more, Lysa contributed "The Chaos" patron for Dungeons & Dragons 5th Edition warlocks. The subclass has been described as "kooky" with "potential to be the most fun subclass out there." This Platinum-best-selling Guild Adept supplement offers combat, danger, intrigue, and pulp! Lysa's encounter "Spa Day" invites characters to a relaxing day off, leaves their equipment in the locker rooms, and unleashes mayhem... and guava smoothies! This Platinum-best-selling Guild Adept collaboration adds new encounters, creatures, chase complications, and more perfect for any jungle setting. Lysa spotlights one of Tomb of Annihilation's new monsters - the chwinga - and makes litterbug adventurers pay for their negligence. The famous proprietor of the Yawning Portal tavern has declared happy hour on his years of business knowledge! 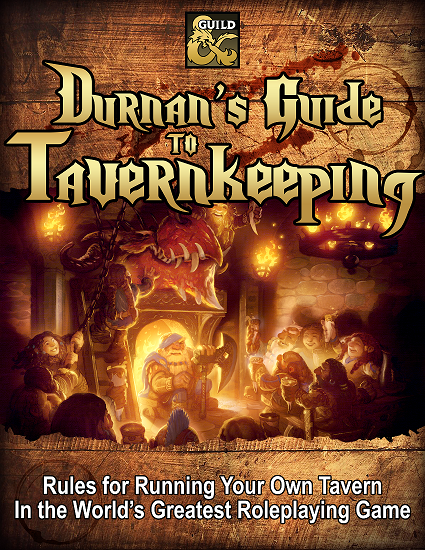 Durnan’s Guide to Tavernkeeping expands on the rules in the Dungeon Master’s Guide and chapter 2 of Waterdeep: Dragon Heist to provide gamers with everything they need to create and manage a fantasy tavern in the world of DUNGEONS & DRAGONS!